Welcome to the 12 Days of Christmas hosted by Ready. Set. Read! and Reading Confetti. For the next 2 weeks Lorie, of Reading Confetti, and I will be sharing 12 of our favorite Christmas books along with a craft or an activity. We will finish our countdown of the 12 days of Christmas books on December 13th. This will give you 12 days before Christmas arrives to do these activities or share these books with your kids. If you are feeling extra ambitious, you could even try doing all 24 activities, the 12 from Lorie's blog and the 12 from my blog. 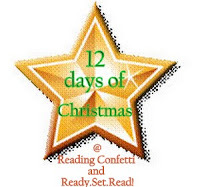 Check out Reading Confetti for a cute way to create a countdown to Christmas with your books! I hope you come back and join us for Christmas crafts for kids and Christmas books for kids each day. Also you can find all of the posts pinned to my Christmas Books for Kids Pinterest board for future reference. What better way to kick off our 12 Days of Christmas than to read a book featuring the song, "The Twelve Days of Christmas"? The 12 Days of Christmas by Rachel Isadora is one of my favorite books! The text of this book is the traditional 12 Days of Christmas song, however, the story is set in Africa. (I had Christmas down in Africa, I diverge.) Africa is actually a great backdrop for this song. Imagine 11 lords a leaping in Mali or 9 ladies dancing in Swaziland. According to the author's notes, Isadora based her cultural illustrations off her actual travels to African countries. Each detailed and vibrant illustration depicts the cultures of Africa. Also, instead of repeating text on each verse, the book contains a rebus type repetition which makes it beneficial for younger readers. From the vibrant end pages to the detailed depictions of daily life, The 12 Days of Christmas by Rachel Isadora is a festive look at a traditional song. The cover art on Isadora's 12 Days of Christmas reminded me of this serrated rectangle puzzle. I made this one out of green craft foam. We used 12 rectangular pieces. Logan (3) is able to order the pieces from largest to smallest on his red mat, creating a Christmas tree. You could also number the pieces 1-12, or put them in a pocket chart that is numbered 1-12-- matching the numbers. There are many ways to scaffold this activity to meet your learner's needs. This is an activity that he will hopefully want to repeat throughout the next few weeks. You could also do this with construction paper and have your child glue it and decorate the tree for a keepsake art project. Don't forget to come back tomorrow for Day #2 and go check out Reading Confetti for more great book suggestions and crafts. I'll be pinning all of our books and crafts to my Christmas Books for Kids Pinterest board. We'd love it if you'd pin our crafts or follow on pinterest! You can also find me celebrating the season on Pinterest, tweeting on twitter, and chatting about the best holiday children’s literature on facebook and Google+. This is really cute! I think my daughter-and even her older brothers :)-would like to do this craft. Thanks for the great idea! Love you holiday ideas! I left a follow-up comment in answer to your question on my dolphin book post. This is really cute. I think it would make a nice, easy craft with the kiddos tomorrow! I saw this pinned on Pinterest and had intended to do it with my little boy. Thanks for posting it! I love Rachel Isadora, but I haven't read this book yet. Thanks for sharing at The Children's Bookshelf.